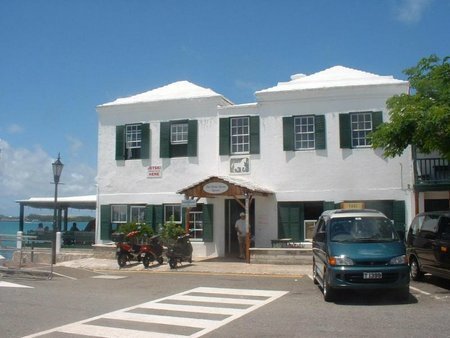 The White Horse Pub & Restaurant is one of Bermuda's oldest and well known pubs, located in St. George in the eastern end of the island and right on the water edge. It offers nice pub food and lively bar scene. They have recently made much improvements. They offer a fairly wide selection of food menu including a range of very nice seafood, quality AAA Angus beef items, great appetizers, larger average portion sizes, and healthier meal choices including a wide selection of salads to choose from. In Appetizers start with chicken tandoori skewers or crab paradise as starters or choose a soup or salad like tropical island salad (sliced chicken breast served with greens), In main courses some of our favorites here are pan seared rockfish, char broiled wahoo fillets, tandoori chicken (grilled in earthen oven) and grilled beef tenderloin. White Horse also has a nightclub open Monday through Thursday called LIGHT nightclub that offers live entertainment till 3 am. There is also a store outlet for guests to take home souvenirs, shirts, hats and such. White Horse now has one of the largest drink menu’s available on the island. It consists of mostly specialty cocktails and drinks. You can enjoy a nice selection of drinks available, from frozen Daquiri’s & Margaritas to flavored Mojitos, Cocktails, Martinis, Shooters and normal beers, wines, sodas and juices. During the summer time, the White Horse also has an outside bar. Here you can watch the boats and yachts pass by. They also provide inside and outside waterfront dining in a relaxed atmosphere. The White Horse Pub & Restaurant now features live music every Tuesday night during the summer. One of Bermuda's leading band Frontline performs outside from 10pm-3am at the Native Islander Bar. The White Horse also has a great Sports Bars in the East End, with wall to wall television & plasma screens. There are four satellites to choose the channels from. They show a selection of NBA, NHL, NFL, Baseball, Nascar, Soccer and Premiereship Soccer games. They accepts credit cards. You can make reservations for groups, otherwise not required. Dress code is smart casual. Soups & Salads: $6-$12, Appetizers/Starters: $10-$16, Main Courses: $25 to $30. Opening hours for lunch on Monday to Saturday is at 10am and on Sundays breakfast starts at 9am. You get excellent codfish with potatoes breakfast on Sundays between 9am to 11am. Bar daily from 10am to 1am. Happy hour discounted drink prices from 5pm to 7pm daily. You can reach Kings Square from Hamilton by bus #1,3,10 or 11. From dockyard, there is a direct ferry to St George (limited runs only between April to November). From St George ferry stop, it's a short walk to the restaurant. Check out St. George Dining Map to see the location of this restaurant and others around. 4) Check Bermuda Nightlife for other great night life options in Bermuda. 5) Check out Restaurants & Bars Directory for a complete list of dining options in Bermuda. 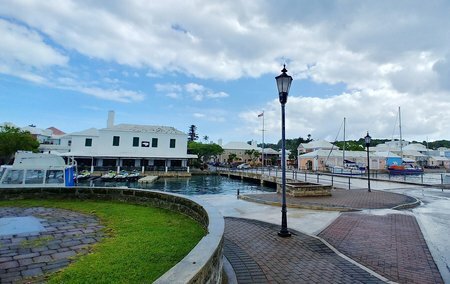 6) Check out St George's Town to know about the historical Town of St. George, its attractions, activities and more. 7) Check out St. George's Parish to know about the parish and all its attractions & activities. Folks at the White Horse Tavern were very helpful and the food was exceptionally good... as it was when we first experienced it almost 50 years ago. Unfortunately the service quality in this great restaurant is on the decline. Nonchalance on part of the staffs and unprofessional behavior is seriously affecting the rating of this restaurant. It used to be listed as part of my Top Restaurants in Bermuda, but no longer so. Hope the management looks into the issue urgently.